The scenery of the Scottish Highlands is renowned throughout the world, from rugged lochs and soaring, snow-capped mountains, to timeless fishing villages and wild, pounding seas, to dreamily romantic shores and peaceful islands. Across each of these landscapes Scotland can boast some wonderful country house hotels, where full five-star service is married to a warm and convivial atmosphere. Roaring log fires and cosy whisky bars welcome visitors, as does the promise of very fine food. Many of these places have a unique character, with something about their architecture, location or history that sets them apart. But only one that I know of can boast something that takes exclusivity to a whole new level: its own private island setting. I visited The Isle of Eriska hotel in the depths of the Scottish winter, when the country was blanketed with snow. 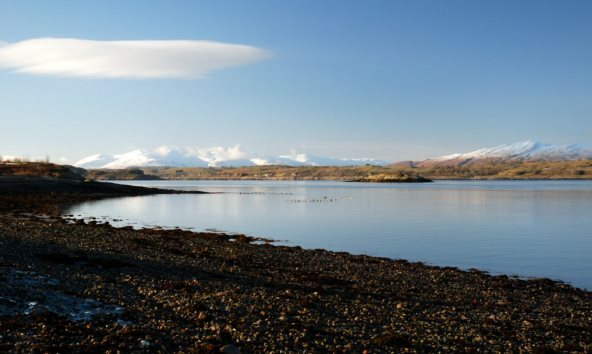 Driving 12 miles north of Oban brings you to the single track road that wends its way to the gates of the estate and the bridge that connects the island to the mainland. There is something magical about the very act of crossing that bridge, knowing that you are now (for a short time at least) resident on your own private island. Indeed the location is central to the spirit of Eriska, with guests making full use of the walking trails, the opportunities to spot the island’s other inhabitants including otters, badgers and seals, and of course the more luxurious man-made attractions including a purpose built spa and golf course. But for myself, and many other guests, the reputation of Eriska’s Michelin starred restaurant is equally compelling. The main house had always been a family home until the island was purchased by the Buchanan-Smith family in 1973. Today, Beppo Buchanan-Smith manages the island and the hotel. Erudite and well-travelled, he has been the driving force in modernising the hotel and ensuring it maintains its appeal since the early 1990s. The emphasis here is on home-from-home comfort. Well, home-from-home as long as you too have log fires burning in your great hall, friendly and efficient staff and timeless surroundings that discreetly blend tradition with modern convenience. Rooms are luxuriously old-fashioned, which means some antique and period furnishings, huge baths and the variety of quirky shapes and sizes dictated by this 1884 building. Amenities are five-star, including flat-screen TVs, robes, bottled water and Molton-Brown toiletries. Shower pressure from the ‘waterfall’ shower in our room was drenchingly good, and everything else was extremely comfortable. Deluxe rooms in the main house are larger. The rooms are going through a rolling programme of modernisation with updated decor and furnishings that give a more contemporary and streamlined feel without losing their character. There is also the choice of modern spa suites nearby. I had a look around a spa suite (right), which was extremely impressive, complete with its own conservatory and outdoor hot-tub where seclusion is guaranteed by private gardens and high surrounding fences. Meals can be taken in the main house, or the hotel staff will deliver a full dinner service, course by course. The whole point of a country house hotel is to offer its guests a relaxing experience that buffers them from the stresses and strains of busy lives and sets an altogether slower pace. The Isle of Eriska does it rather better than most. The island setting helps of course, but then so too do the staff, the environmnet and the hotel’s own rituals and routines. Afternoon tea is one highlight. In winter it is served just as the light is fading, and guests pick their favourite spot in one of the numerous lounges where blazing log fires have been set, where plump sofas and cosy armchairs abound, and where a selection of newspaper, periodicals and books is at your disposal. To the sound of ticking clocks and a crackling fire, delightful scones, perfect little cakes and crumbly shortbread are served. Many people linger for an hour or more, until it is time to head upstairs and contemplate dinner to come. By your second evening in a house like this you are on nodding terms with most guests and have enjoyed conversations with others, so whilst the dinner service may be formal, there is a relaxed atmosphere whether seated in the chic, contemporary surroundings of the dining room (left) or large conservatory extension. Non-residents can dine at the hotel if space permits, and prior reservations are required. Head Chef Robert MacPherson has been at the helm since 1997 and has held three AA rosettes throughout that time. Yet clearly he is a chef who keeps abreast of culinary innovation. The kitchen garden supplies herbs and vegetables, and local sourcing is taken seriously, extending to guaranteeing the survival of a local organic pig farm when economic times got tough by contracting to buy a year’s supply in advance. Over the course of my two dinners this kitchen rarely put a foot – or even a toe – wrong. Dinner is a table d’hote affair, with three choices at each course. Highlights for me included a brilliant and quite simple dish of grilled fillet of Sea Bass on a cassoulet of mussels, roasted peppers and young leeks. The fish was crisp-skinned, juicy and moist, the mussels plump and full of flavour and the little stew of vegetables deeply flavoured and cooked perfectly. Roasted fillet of aged Scotch beef came with a shallot jam, a brilliantly simple dish of salsify cooked in red wine and rather up-market Yorkshire pudding. Eriska’s cheese trolley is quite rightly famed, and is one of the best selections (and served in the best condition) that I have seen in Scotland. Around 40 British and French cheeses make up the selection, which can be sampled pre- or post-dessert. Puddings themselves were very good indeed, my favourite probably being a silky ginger and lemongrass panacotta, set against the contrasting texture and flavour of a little walnut cake and honey syrup. Coffee and homemade chocolates are served by the fireside, and many guests relax to the bar for a single malt digestive. A word for the wine list too: holder of the AA notable wine list award, there is a very good choice with whites and reds starting at just £14, Champagnes at £33.50. At the serious end of the list there is value to be found, where wine lovers have been given a relative break on margins, and wines like the 1998 Château Batailley (£69), 1988 Château Canon (£80) or 2005 Cheval des Andes (£73.50) all represent fair prices. A visit to Eriska is something very special indeed, especially if you can afford to spend two or three nights there to really unwind, explore the island, and relax into its unique atmosphere. I enjoyed my winter visit, though obviously warmer weather brings the opportunity for those so inclinded to use outdoor facilities like its own golf course, mountain bikes and croquet lawn. The hotel’s Spa is impressive, with ozone filtered, 17-metre pool kept at a balmy 30 degrees, ESPA treatment rooms, barber shop gym and saunas. The spa block has its own more casual lunch-time restaurant and bar, and a new multi-purpose indoor sports facility was nearing completion on my visit. A visit to Eriska is expensive, with standard rooms starting at £340 per night for dinner, bed and breakfast for two in winter, rising by £100 in summer. But then you are buying not only supreme comfort and hospitality (afternoon tea, newspapers, etc., are all included in the rate), but fine food, excellent service, and more than that, the chance to really escape in one of the UK’s most beautiful and romantic settings. I look forward to my next visit.